I’ve received several e-mails asking for the value of a Lincoln cent with an image of John F. Kennedy on it. I’ve also received questions about an imprint of a map of a state along with the 2 letter abbreviation. 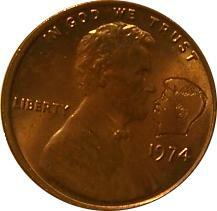 Here’s an example of the Lincoln Kennedy Cent that was selling on eBay for $0.99. They can be fun conversation items, but calling them commemoratives and collectors items is stretching the truth in my opinion.